Note: For those that attended Jaap and my session on Thursday, PowerShell Tips & Tricks for Exchange, and are looking for the scripts used in the demonstrations, they are available here. The slidedeck is available here. Today I returned from one of the largest, independent conference on Microsoft technologies, as it is not sponsored by Microsoft. Sessions were spread over a 3 day period on popular topics as SharePoint, SQL, developer and Windows, as well as out beloved Exchange. In addition, the conference offered pre and post-conference workshops. 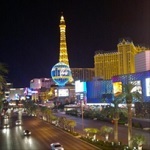 The conference was held in the city of Las Vegas, a place which I hadn’t seen after I left it around 1996 when leaving something called Comdex. The estimated total of attendees was 1,400, of which around 100-200 attended Exchange sessions since people were free to switch between tracks. With this being my first Exchange Connections, I must confess the community feeling and depth of contents were well-above expectation. Exchange sessions were not only presented by independent Exchange MVP’s and MCSM’s, but there were also sessions hosted by Tim McMichael and Wes Blalock of Microsoft. Greg Taylor, Exchange PM CXP, was also present, but unfortunately didn’t host any session. The Exchange track was kicked off by an plenary session for those interested in everything Exchange or related topics such as Office 365. I am still waiting for the formal feedback and ratings on the PowerShell Tips & Tricks for Exchange session with Jaap I did on Thursday, but unofficial feedback was overall good which I am happy with since this was my first presentation in front of an international audience and I am somewhat self-critical. The week was closed with a Exchange panel session, wrapping up the week and answering audience questions. It was also when the winners were announced of the trivia contest offered by sponsor ENow. Prizes included an Xbox One and $500 in cash. When connecting with the community, you get a sense on the current opinion on the product and future plans. It was learned that the majority of the attendees are still running Exchange on-premises and a vast majority still runs Exchange 2007 or Exchange 2010. There were quite a few comments on product quality, mainly referring to the recent issues with Exchange 2013 Cumulative Updates resulting in Hybrid Configuration Wizard issues, issues with Exchange 2013/Exchange 2007 co-existence deployments, or more recently issues experienced when using Chrome with the Exchange Administrative Center. I had a blast at Connections, despite a minor inconvenience as my luggage was delayed. There were lots of opportunities to meet up at the conference, receptions, many dinners and the excellent Scheduled Maintenance party. Outside of these formal events, people were also actively looking each other up to exchange musings over a pint. Having experienced my inaugural Exchange Connections this year, I must say I am really looking forward to next year’s event to stay in contact with the community, and catch up with my MVP and MCSM friends. The MVP Summit is next up on the agenda, so I won’t have to miss most of my MVP friends for long. I was also very pleased with my Huawei E5372, a so-called MiFi device which functions as a mobile WiFi access point, routing traffic to a mobile data provider at a fraction of the roaming mobile data costs. In the end, the amount of mobile data used after this week was rather low, which mainly can be attributed to the excellent WiFi facilities in Aria, the conference hotel. One final shout out to ENow for the personalized NFL jersey. People attempted pronouncing my last name, and most came up with “The Rouge” which is close enough for me. Austrian MVPs Martina Grom (Office 365) and Toni Pohl (Client Development) analysed Twitter data related to IT/Dev Connections 2014, and came up with some nice statistics where they present here. It seems I was a Top 10 Tweeter. 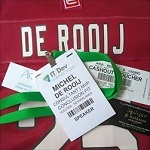 This entry was posted in Exchange and tagged Event by Michel de Rooij. Bookmark the permalink.